As well as being able to chat on public channels, mIRC also allows you to chat privately with someone. There are several different ways to do this. double-click on their nickname in the nickname listbox and a private query window will open up. You can then start chatting privately to them through the query window. 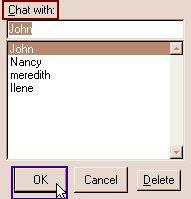 or type the command /query nickname, where nickname is the person you want to chat with. Press the enter key, and a query window will open up and you can start chatting privately, assuming of course that the person is on IRC. Chat privately with DCC Chat: DCC stands for Direct Client to Client. A DCC connection establishes a direct communications link between two users that is separate from the normal IRC channels. Because it is a separate link, it is the most secure method of communicating with another user and usually faster because it doesn't rely on the IRC Server to relay your messages. It does need to use the IRC Server to initiate the chat session. and a dialog box will pop up. you will be able to start talking to them privately. you can click your left mouse button on the person's name to select them. Then click with the right button and a popup menu will appear with various options, one of which will be to open a private DCC to the person selected. Now select Chat. An added benefit, as with any IRC communication, is that the DCC conversations can be logged.